The continued interest in Victorian music boxes in this age of Spotify and streaming was evident when three were among the 1500-lot sale held by Unique Auctions (17.5% buyer’s premium) to launch the new year. This Victorian walnut music box inset with a clock sold for £5000 at Unique Auctions. Best of the trio by a distance was this high-quality walnut box inset with a clock, above. The 2ft 3in (68cm) wide box with decorative inlay played eight airs on miniature bells and was labelled PVFA Ste. Croix, Suisse. The name is not well known but the village of Ste Croix prides itself on being the early capital of mechanical music and no fewer than 40 firms were known to have employed about 600 people there in the late 19th century. This box was estimated at £1000-1500 at the January 1 sale in Lincoln but attracted widespread Continental bidding before selling to a London collector at £5000. 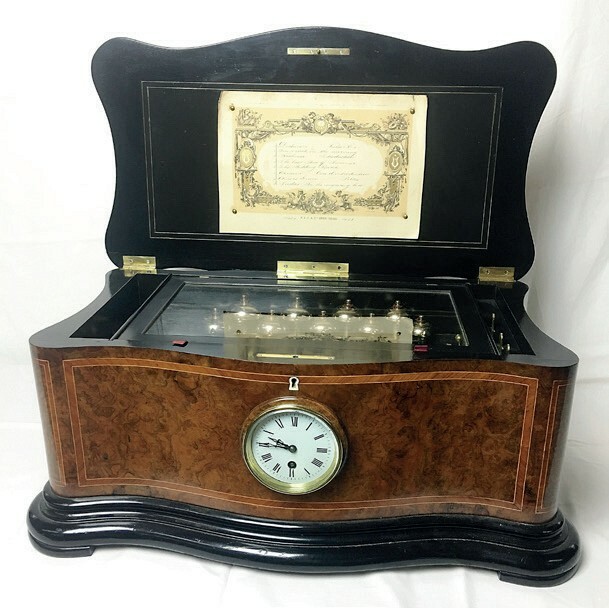 A typical 12-tune music box by the better known Nicole Frères went comfortably above expectations at £970 and a mahogany-cased Polyphon with 37 discs more than doubled the top estimate in selling at £700.